Jodi Picoult had me at Hello. I feel in love with her writing style and her flawless ability of crafting diverse characters and a heart-pounding story line. Small Great Things would have been an automatic purchase for me had I not had the opportunity to receive it for review. To say that I didn't squeal and parade around the house(confusing 2 dogs and my fiance) would be a lie. I immediately cracked open the book, and after reading the 'Dear Reader' note, I knew I was going to be told an unforgettable story. One of Picoult's writing traits that I adore most is her multi-perspective delivery. The story is never one-sided. We get an in-depth look at every characters point of view, changing the way you view each situation dramatically. Another wonderful trait of Picoult's is her ability to tackle hard hitting topics. Small Great Things is being released during a very critical time. We are in the midst of horrible hate crimes against the LGBT community, as well as the all of the crimes that have led to the #blacklivesmatter movement. Small Great Things really opened my eyes as to what is so blatantly in front of us. I would be done reading for the night and then turn on the news and continue to see the fight that Ruth Jefferson is dealing with. 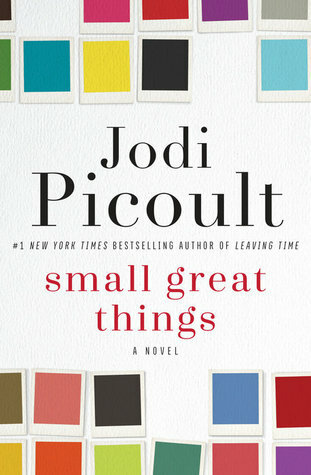 Small Great Things tackles it all: Racism, stereotypes, violence, death and the justice system. You will go into this book thinking one thing, and end it thinking something completely different. In my opinion, Jodi Picoult can deliver courtroom drama better than Law and Order! You heart will pound and you will find yourself sitting on the edge of your seat, impatient with suspense! I love all of Picoult's books, but Small Great Things has easily become my favourite. Each character, each emotion radiate off of the pages. You will be left with sore eyes from crying and a softer heart. You will release a breath that you didn't even realize you were holding once you turn the last page. Like an onion, picoult delivers this story one layer at a time. Delicately placing you in each characters shoes, each leaving a little piece of them with you after each visit..
Small Great Things is writing at its best! It easily earns its place next to To Kill a Mockingbird and Toni Morrison. I also hope that this book makes it way into the high school curriculum, not only because it discusses the justice system, race and prejudice, but because it is also a beautiful example of strength and redemption. Small Great Things hits shelves Tuesday, October 11th, 2016! Books that Tackle the Tough Stuff!